Feast your eyes on the beauty that is ArtDeco’s forthcoming collection for spring/summer 2012, Marrakesh Sunset. Inspired by Morocco’s most famous city, these limited edition lovelies feature shades of aqua, coral, pink and bronze and are beautifully packaged and designed. 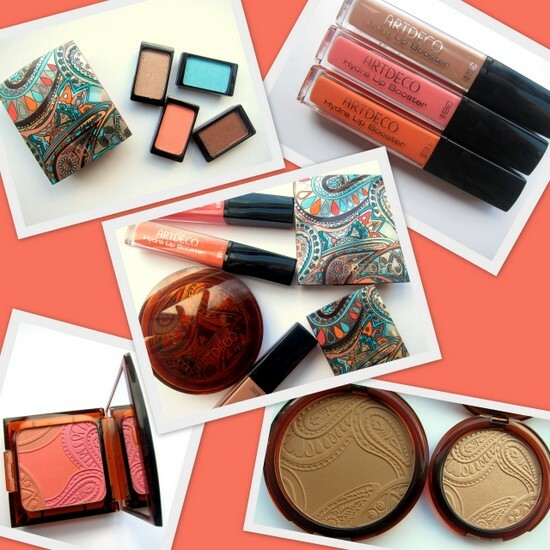 The eyeshadow and blusher palettes both feature a gorgeous paisley pattern in hues that mirror those found in the products. The shadow case is €6.45 and holds two shadows, priced separately at €6.75 each. There are four to choose from, in 13 Bronze Mirror, 30 Drifting Sand, 235 Sweet Apricot and 258 Clear Blue. The Bronzing Glow Blusher, €23.70, is imprinted with the same design as its casing, and combines shades of coral, fuchsia and rosewood tones that are designed to work separately or together. Two shades of Bronzing Powder Compact are on offer at €28.15, in 02, the darkest, and 06, the lighter of the two. These come in a really lovely turquoise and amber palette, as does the smaller sized Bronzing Glow Powder, €21.50, a pretty highlighter for the face, shoulders and décolleté. There are three available shades of gloss in 18 Translucent Mandarin, 32 Translucent Mocha and 38 Translucent Rose, which are all priced at €12.40. The collection also includes 4 shades of Ceramic Nail Lacquer, €11.05 each, an All in One Waterproof Mascara at €17.65, and three colours of Spray-on Leg Foundation, €25. I don’t have a huge amount of ArtDeco products but the bits I’ve tried, I’ve loved. Their pen eyeliner is one of the best around and their nail polish was the first product I ever tried with a wider brush, for easy application. So I was thrilled to receive these and am really looking forward to testing them and sharing my thoughts –any views on what you’d like to see reviewed first? Marrakesh Sunset is limited edition and will be out from the beginning of April; you can find ArtDeco in Debenhams, and selected salons nationwide. Love the look of the palette and the gloss in the middle there, lahffly altogether! what a lovely beauty blog! Im following you, for your updates, if u like do so...! I've never heard of this brand before, but I adore the packaging! That is so so so so pretty! omg! this looks so wonderful! It just screams Morocco doesn't it? Love this! The compact packaging alone is so pretty! So pretty! I love all the bright colors, and the packaging makes it so fun. Ooh, I've never heard of this before but I love the packaging, the paisley print in the powders is such a nice detail. Must go have a look in debenhams! Thanks for stopping by my blog! =) New follower, here! I love this look. It is very fresh and different. Love the name and the packaging - sold ! your blog is so fashion!! really nice post! The packaging is to die for!! Even if the products weren't amazing, I'd still go for this line even just for the packaging! So pretty! Wow these are such great Colors. I love it. great products, i love the packaging! The packaging is really nice! Never tried Art Deco items but one of my friends always buys some of their stuff from a local salon! wow so jealous! that make up has beautiful packaging! Reviewed this collection as well, I really like the blusher, use it loads! Sounds like a great color pallet, and I love the packaging!